Just Jingle: Want A Hug? How About 8 at Once? My dear friend, Taylor, has put together a fabulous new sketch challenge over on the Gourmet Rubber Stamps blog today! I simply HAD to play along! I used the super adorable Merry Marine set for my card! 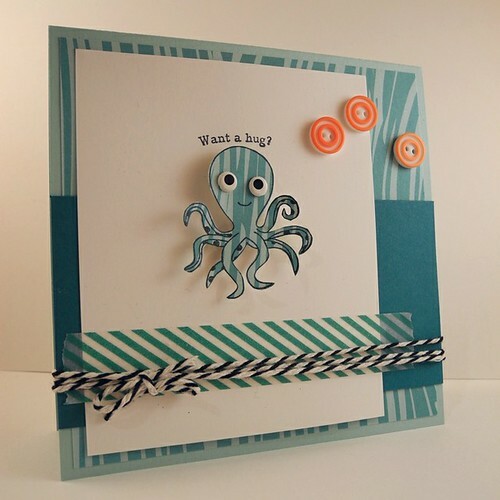 Don't you just want to hug that stinking cute octopus? HA! 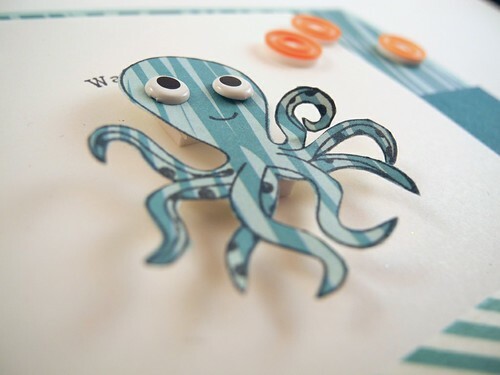 I paper pieced him and added some super fun eye brads from the Eyelet Outlet! LOVE THOSE! And...I have a friend who needs a hug this week, so I think I will send this one off to her! As for YOU, well, you know what you should do...head on over to Gourmet Rubber Stamps and make an awesome card using this sketch below and show it off!!!! We love to see your stuff! I love it! That octopus is so cute, and those eyes again. Love them. The pops of orange are a super touch too! I am loving those colors! so darn cute...those eyelets are so fun.. I love the sentiment. I have that stamp and never could think of a good saying! Fun card and a great sketch. I like that you popped him up on dimensionals, so cute. Cool card, that would be a great hug!